One of the biggest problems I have when it comes to Purim is how I’m going to fill my myriad of Shalot Manot baskets and not have to take a second mortgage out on my house to buy all the stuff it will take to not make them look awkwardly slightly empty because I ran out of “stuff”. I rack my brains every year to find the right mix of playful container, yummy goodies and insightful yet humorous greeting to accompany said basket. One year the theme was chocolate, the next muffins and another was s’mores. This year due to time constraints such as “where did it go?” and “I got no time left” I decided to go with wine, Clementines, my very own homemade hammentashen and a couple of really delicious snack mixes. Shalos Manot (the sending of portions) is the baskets of food given to friend, family and the community on Purim. 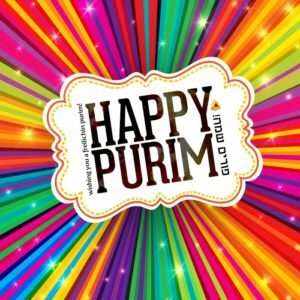 Jewish law mandates the giving of two different types of “ready to eat foods”, to at least one person on Purim hence our need to give them to everyone we’ve ever met and a few we haven’t. Trail mix or granola really fits the bill both expense wise and bulk wise when it comes time to figure out what to pack into the basket along with the fruit, wine or grape juice and candy. 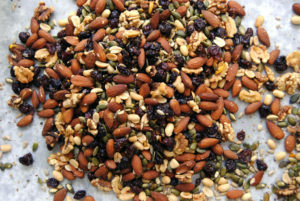 A first-class, satisfying and delicious trail mix usually consists of nice mix of sweet and salty flavored ingredients with a dash of chocolate thrown in for fun. I typically use nuts, cereal, dried fruit and again, chocolate in some form. The following recipes are guaranteed to satisfy the mandate to be generous and give as well as having your friends begging you for the recipes. TIP: To wrap up your mixes you can use a small plastic sandwich bag and tie it with ribbon or you can put it in a pretty tin or bowl and cover it with plastic wrap. ← NEW YEAR, NEW APPITZER RECIPES!